Great. Wonderful powerful stuff, get your tickets now. Physical Fest 2010, Sat 5 – Sat 12 June 2010. 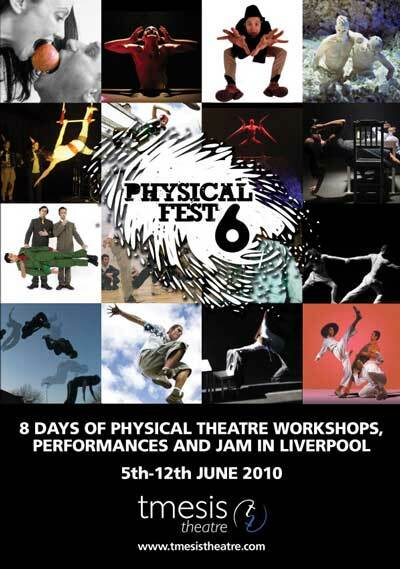 Liverpool based Tmesis Theatre return this June with their sixth annual festival of physical workshops and performances, ‘Physical Fest’, the only festival of its kind in Europe. Physical Fest brings the world’s best local, national and international movement and physical theatre artists to Liverpool in an exciting 8 day programme of events, workshops, taster classes and performances. It aims to bring new movement techniques to the city and hosts northwest premiers. The festival is fast becoming one of the international key events in Liverpool’s cultural programme with participants flocking from the national and international community. The festival has previously enjoyed great success, having hosted workshops from some of the world’s pioneers in movement and physical theatre such as; Yoshi Oida (Peter Brook) and Tanya Khabarova (Derevo), Jean – Laurent Sasporters (Pina Bausch Tanztheater), Gennadi Bogdanov (Biomechanics), Ira Seidenstein (Cirque De Soleil), Jorge Lopes Ramos (Zecora Ura), Marie-Gabrielle Rotie (Butoh UK) and many more. This year’s exciting line up runs from the 5th – 12th June and is made up of a whole host of stimulating workshops and performances. Tmesis Theatre are to host a three day workshop with writer Chris Fittock, looking at the techniques they used to create their current touring success; The Dreadful Hours. The festival will also see master of the ridiculous; Javier Marzan of acclaimed comic company, Peepolykus, hold a workshop on improvisation and spontaneity in theatre. We hope you won’t be ‘black & blue’ as the renowned circus group hold a beginners Ariel workshop at the city’s Contemporary Urban Centre. Participants can also spend two days with Al Seed doing ‘Creaturing,’ a unique technique of non- human movement, and after popular demand Airborne Entertainment are back with their fantastic one day workshop in Free Running! If that wasn’t enough, this year’s Physical Fest will allow you to get in touch with your inner self with outdoor morning Tai-Chi classes at St Luke’s, Bombed Out Church, Gardens in addition to evening classes in Angola Capoeira, local instructor Alicia Smith with Pilates and a workshop from the fantastic Taciturn Dance. The pinnacle of this year’s festival is the first ever ‘Fest Live’ at the Black-E, to be held on Sat June 12th from 7pm. Fest Live is an exciting open platform performance night, giving the opportunity for new and established artists to try out ideas as well as hosting extracts of professional work. Fest Live includes extracts and performances from; Airborne Entertainment, Mary Pearson, XY,Just Add Water, Taciturn and Pei Tong. Fest Live will also have the annual, FEST JAM. A 30 minute non-stop live improvisation from the practitioners and participants of the festival, sure to be a , not to be missed, energetic theatrical experience. Workshop Prices: 1 day £40, 2 days £75, 3 days £115. All 8 days of classes & workshops £300. Tickets for evening classes: £5/£3.50 concessions. To book your place now, call 0781 330 1517 or email physicalfest@tmesistheatre.com.